Size: Maximum size: 127 cm. Native Range: St. Lawrence-Great Lakes, Hudson Bay (Red River drainage), and Missouri-Mississippi River basins from southern Quebec to southern Manitoba and Montana south to the Gulf. Possibly also native on Atlantic and Gulf slopes from the Susquehanna River to the Neuse River, and from the Savannah River to Lake Okeechobee, Florida, and west to northern Mexico and eastern New Mexico (Page and Burr 1991). Table 1. States with nonindigenous occurrences, the earliest and latest observations in each state, and the tally and names of HUCs with observations†. Names and dates are hyperlinked to their relevant specimen records. The list of references for all nonindigenous occurrences of Ictalurus punctatus are found here. Means of Introduction: Intentionally stocked for sport fishing and food. The first introductions in the Colorado River took place in 1892-1893 or in 1906 (Miller and Alcorn 1946). They had become established throughout the Colorado basin by the early 1900s (Holden and Stalnaker 1975). 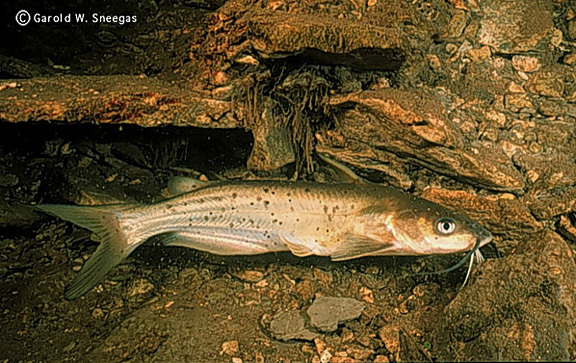 The earliest stocking record for the Yampa River is from 1944 and involved 34,200 fingerling catfish (Tyus 1998). The introductions into Silver Lake and the Charles River in Massachusetts involved albino fish from the aquarium trade (Cardoza et al. 1993). Status: Established in most waters where introduced. Impact of Introduction: The Channel Catfish hybridizes with the threatened Yaqui catfish I. pricei in Mexico (U.S. Fish and Wildlife Service 1994). Colorado pikeminnow Ptychocheilus lucius, an endangered species, have been documented to choke on introduced Channel Catfish when attempting to eat them (McAda 1983; Pimental et al. 1985; U.S. Fish and Wildlife Service 1990). Jenkins and Burkhead (1994) speculated that introduced Channel Catfish may have contributed to the demise of an isolated population of trout-perch Percopsis omiscomaycus in the Potomac River in Virginia and Maryland. Introduced Channel Catfish may exert a major negative effect on populations of various endangered species. For instance, this species is known to prey on small and large endangered humpback chub Gila cypha in the Little Colorado River thereby limiting recruitment and also increasing adult mortality (Marsh and Douglas 1997). There is also evidence that this introduced catfish preys heavily on juveniles of razorback sucker Xyrauchen texanus that had been reintroduced into the Gila River of Arizona (Marsh and Brooks 1989). Introduced predatory fishes, including the Channel Catfish, may be partially responsible for the decline of the Chiricahua leopard frog Rana chiricahuensis in southeastern Arizona (Rosen et al. 1995) and have been shown to reduce the abundance and diversity of native prey species in several Pacific Northwest rivers (Hughes and Herlihy 2012). Channel Catfish predation on crayfish resulted in a great loss of crayfish density in mesocosm experiments, and is likely the cause of native crayfish population decline in natural habitats where the Channel Catfish has been introduced (Adams 2007). Remarks: Tyus et al. (1982) gave a distribution map for this species in the upper Colorado basin. Channel Catfish have also been stocked in many native areas including Arkansas (Robison and Buchanan 1988); Illinois (Burr, personal communication); Nebraska (Jones 1963). Harlan et al. (1987) stated that stocking in Iowa has widened this species' distribution. Cross and Collins (1995) mapped the species in every county in Kansas. Cross (1967) indicated a much more restricted distribution in the state and did not include every county. Presumably the more recent map indicates the species had been introduced to new locations since the 1967 publication. Cross (1967) also stated that it had been stocked in many lakes and ponds in the state. Griffiths (1939) reported that the Channel Catfish was found in the ladders of the Bonneville Dam but no specimens were obtained. If introduction did occur it is though that they were unsuccessful. According to Springsteen (2010), the Channel Catfish was the first species to be raised in commercial aquaculture for food purposes in the US. Before that point, other species including tilapia and carp were raised in Egypt and China for sport. The species was farmed in the Mississippi Delta region during the 1950s. Adams, S.B. 2007. Direct and indirect effects of channel catfish (Ictalurus punctatus) on native crayfishes (Cambaridae) in experimental tanks. American Midland Naturalist 158: 85-96. Dahlberg, M. D., and D. C. Scott. 1971a. The freshwater fishes of Georgia. Bulletin of the Georgia Academy of Science 29:1--64. Fowler, H. W. 1906. The fishes of New Jersey. Pages 35--477 in Annual Report of the New Jersey State Museum (1905), part II. MacCrellish and Quigley, State Province, Trenton, NJ. Fowler, H. W. 1952. A list of the fishes of New Jersey, with off-shore species. Proceedings of the Academy of Natural Sciences of Philadelphia CIV:89--151. Griffiths, F. P. 1939. Considerations of the Introduction and Distribution of Exotic Fishes in Oregon. Trans. Am. Fish. Soc. 69: 240-273. Holden, P. B., and C. B. Stalnaker. 1975. Distribution and abundance of mainstream fishes of the middle and upper Colorado River basins, 1967--1973. Transactions of the American Fisheries Society 104(2):217--231. Howells, R. G., and J. A. Prentice. 1991. Performance of Florida largemouth bass from Cuba in Texas waters. Texas Parks and Wildlife Department Management Data Series 59, Austin, TX. 13 pp. Hubert, W. 1994. Exotic fish. Pages 158--174 in T. L. Parrish, and S. H. Anderson, editors. Exotic species manual. Wyoming Game and Fish Department, Laramie, WY. Lanigan, S. H. and C. R. Berry. 1981. Distribution of fishes in the White River, Utah. The Southwestern Naturalist 26(4): 389-393. Kraai, J. E., W. P. Provine, and J. A. Prentice. 1983. Case histories of three walleye stocking techniques with cost-to-benefit considerations. Proceedings of the Southeastern Association of Fish and Wildlife Agencies 37(1983):395--400. Lee, D. S., A. Norden, C. R. Gilbert, and R. Franz. 1976. A list of the freshwater fishes of Maryland and Delaware. Chesapeake Science 17(3):205--211. Loyacano, H. A. Jr. 1975. A List of Freshwater Fishes of South Carolina. Bulletin of the South Carolina Experimental Station. Bulletin 580, 9 pp. Maciolek, J. A. 1984. Exotic fishes in Hawaii and other islands of Oceania. Pages 131--161 in W. R. Courtenay, Jr., and J. R. Stauffer, Jr., editors. Distribution, biology, and management of exotic fishes. The Johns Hopkins University Press, Baltimore, MD. Marsh, P.C. and J.E. Brooks. 1989. Predation by Ictalurid catfishes as a deterrent to re-establishment of hatchery-reared razorback suckers.. Southwestern Naturalist 34(2):188-195. http://www.jstor.org/stable/3671728. McAda, C. W. 1983. Colorado squawfish, Ptychocheilus lucius (Cyprinidae), with a channel catfish, Ictalurus punctatus (Ictaluridae), lodged in its throat. Southwestern Naturalist 28(1):119--120. Moyle, P. B., and R. A. Daniels. 1982. Fishes of the Pit River System, McCloud River System, and Surprise Valley Region. University of California Publications, Zoology 115:1--82. Pflieger, W. - Missouri Department of Conservation, Columbia, MO. Pimental, R., R. V. Bulkley, and H. H. Tyus. 1985. Choking of Colorado squawfish, Ptychocheilus lucius (Cyprinidae), on a channel catfish, Ictalurus punctatus (Ictaluridae), as a cause of mortality. Southwestern Naturalist 30:154--158. Prentice, J. A. 1977. Texas statewide walleye stocking evaluation. Federal Aid Project F-31-R-3. Pritchard, D. L., O. D. May, Jr., and L. Rider. 1976. Stocking of predators in the predator-stocking-evaluation reservoirs. Proceedings of the 30th annual conference of the Southeastern Association of Game and Fish Commissioners 30(1976):108--113. Raasch, M. S., and V. L. Altemus, Sr. 1991. Delaware's freshwater and brackish water fishes -- a popular account. Delaware State College for the Study of Del-Mar-Va Habitats and the Society of Natural History of Delaware. 166 pp. Reilly, S. 2000. Rotonda fish population jumps. Sun Herald. Available online at URL http://www.sun-herald.com. Richardson, W.M., J.A. St. Amant, L.J. Bottroff, and W.L. Parker. 1970. Introduction of blue catfish into California. California Fish and Game. 70: 311-312. Rohde, F. C., R. G. Arndt, J. W. Foltz, and J. W. Quattro. 2009. Freshwater Fishes of South Carolina. University of South Carolina Press, Columbia, SC. 430 pp. Smith, H. M. 1896. A review of the history and results of the attempts to acclimatize fish and other water animals in the Pacific states. Bulletin of the U.S. Fish Commission for 1895, 40:379--472. Springsteen, Elizabeth R. 2010. Aquaculture and the Lacey Act. An Agricultural Law Research Project published by the National Agricultural Law Center at the University of Arkansas, 1-5. Stauffer, J. R., Jr., J. M. Boltz, and L. R. White. 1995. The fishes of West Virginia. West Virginia Department of Natural Resources. Academy of Natural Sciences of Philadelphia, Philadelphia, PA. 389 pp. Sakamoto, M. 2002. Deadly nymphs. Hawaii Fishing News. 25(5): 16-17. U.S. Fish and Wildlife Service. 1990. Colorado squawfish recovery plan. U.S. Fish and Wildlife Service, Denver, CO. 56 pp. U.S. Fish and Wildlife Service. 1994. Yaqui fishes recovery plan. U.S. Fish and Wildlife Service, Albuquerque, NM. 48 pp. Waldrip, L. 1993a. 1992 fish stocking report. Texas Parks and Wildlife Department. January 8, 1993. 1993: 9-12. Waldrip, L. 1993b. Fish Stocking Report. Texas Parks and Wildlife News. March 5, 1993. 1993: 7-8.